All these Medals are available with ribbons and can be fully personalised if you want them engraved directly or as a boxed medal option. Claymore have a wide selection of medals which include: Football, Swimming, Athletics, Tennis, Basketball, Netball, Gymnastics, Karate, Hockey, Rugby, Golf, Motorsport, Badminton, Multi-purpose, Equestrian, Cycling, Fishing, Judo, Pool & Snooker, Ten Pin Bowling and even Themed Medals. 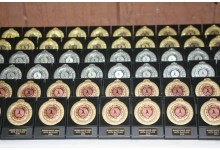 In addition to the quality medal, we can also personalise the centre with you club badge, logo or emblem. Whichever one of these Medals you're after; Gold, Silver and Bronze, we're sure your achievers will be proud to receive.